U.S. and Russian engineers are readying a trio of rockets for launches from Virginia, Florida and Kazakhstan Thursday and Friday, two to send a combined 6.5 tons of cargo to the International Space Station and one from SpaceX to boost a Qatari communications satellite into orbit. Continuing a rapid-fire launch pace, China plans to launch a pair of Beidou navigation satellites Monday followed by another SpaceX flight, this one from California, to put more than 60 small satellites from 17 nations into orbit. At the Kennedy Space Center in Florida, SpaceX engineers are readying a Falcon 9 rocket for launch from historic pad 39A on Thursday to boost Qatar's Es'hail 2 satellite into orbit, a powerful relay station intended to carry direct-to-home television across the Middle East and to provide amateur radio services for Brazil and India. The California rocket builder test fired the Falcon 9's first-stage engines Monday night, clearing way for liftoff Thursday at 3:46 p.m., the opening of a one-hour 43-minute window. Forecasters predicted a 60 percent chance of favorable weather after a cold front moves through the area. The outlook improves to 90 percent "go" on Friday. 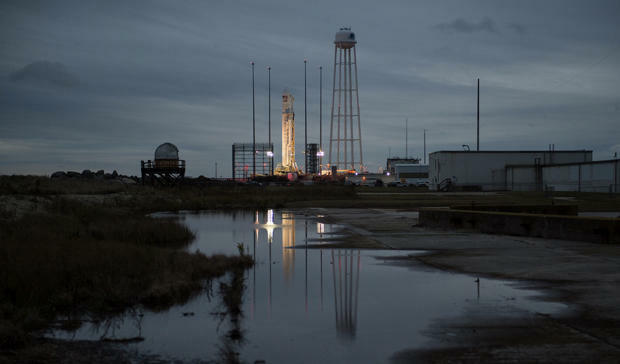 At the Mid-Atlantic Regional Spaceport -- MARS -- at NASA's Wallops Island, Virginia, flight test facility, Northrop Grumman is readying an Antares rocket for launch early Friday to send a Cygnus cargo ship to the International Space Station. The automated spacecraft is packed with 7,385 pounds of equipment and supplies, including fresh fruit and ice cream. Launch originally was planned for Thursday, but a 90 percent "no-go" forecast prompted a 24-hour delay. Liftoff now is targeted for 4:23:55 a.m. Friday, roughly the moment Earth's rotation carries MARS pad 0A into the plane of the space station's orbit. Forecasters expect a 45 percent chance of good weather, improving to 90 percent "go" on Saturday. Half a world away at the Baikonur Cosmodrome in Kazakhstan, engineers are readying a Russian Progress cargo craft for a second launch to the International Space Station Friday afternoon. Loaded with 5,654 pounds of propellant, air, water and supplies, the Progress' Soyuz FG booster is scheduled for liftoff at 1:14:08 p.m. (12:14 a.m. Saturday local time). If all goes well, the Cygnus cargo craft will reach the station around 4:35 a.m. Sunday, pulling up to within about 30 feet and then standing by while astronaut Serena Auñón-Chancellor uses the lab's robot arm to lock on to a grapple fixture. From there, flight controllers at the Johnson Space Center in Houston will take over, pulling the supply ship in for berthing at the Earth-facing port of the central Unity module. Ten hours later, the Progress is expected to arrive, guiding itself to an automated docking at the aft port of the Russian Zvezda service module around 2:30 p.m. It will be the first time two cargo ships have reached the station on the same day. Cosmonaut Sergey Prokopyev and Expedition 57 commander Alexander Gerst will be standing by in the Russian segment of the station to take over by remote control if any problems develop. "Alexander Gerst is going to be helping out his Russian colleague for the Progress vehicle," said Joel Montalbano, deputy manager of the space station program at the Johnson Space Center. "Normally, it's an automated docking, but they need to be prepared to go ahead and do a remote controlled docking (if necessary). We've worked with our Russian colleagues to ... give him some refresher training." The Progress launch Friday will be the first station flight with a Soyuz FG booster since a dramatic launch abort Oct. 11 that forced vehicle commander Alexey Ovchinin and NASA flight engineer Nick Hague to execute a dramatic-but-safe emergency abort. Russian engineers concluded the mishap was caused by the failure of a strap-on booster to separate cleanly two minutes after liftoff. The booster, one of four making up the first stage, crashed into the rocket's central core stage, throwing the it out of control and triggering the abort. Since then, the Russians have launched three Soyuz boosters without incident for non-station flights. The Progress MS-10/71P launch Friday will be the fourth since the abort and if all goes well, the Russians will press ahead with plans to launch a fresh crew -- Soyuz MS-11/57S commander Oleg Kononenko, Canadian flight engineer David Saint-Jacques and NASA astronaut Anne McClain -- on Dec. 3. They will join Gerst, Auñón-Chancellor and Prokopyev aboard the station, boosting the lab's crew back to six for the first time since Oct. 4 when three other station fliers returned to Earth. The day after the new crew's arrival, SpaceX is scheduled to launch a Dragon cargo ship that is expected to reach the space station on Dec. 6. Gerst and his crewmates will return to Earth on Dec. 20, closing out a 196-day mission. Kononenko, Saint-Jacques and McClain will have the lab to themselves until early April when the next Soyuz is launched from Kazakhstan with fresh crew members.